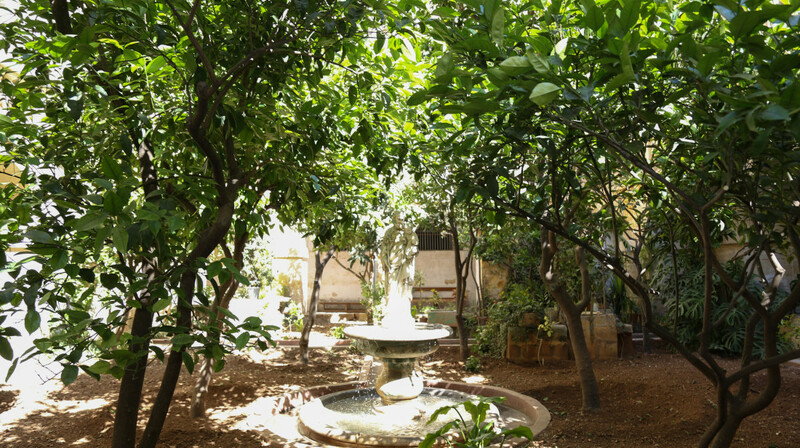 The garden of St.Catherine's Monastery,Valletta is one of two gardens which will be open to the public for the duration of the Valletta Green Festival. Valletta 2018 Chairman Jason Micallef with Environmental Landscaping Consortium Chairman Peter Calamatta announced details for the Valletta Green Festival this morning. Two 400-year-old gardens in Valletta will be opening to the public for the first time during the Valletta Green Festival from 6- 8 May. The Festival is a Valletta 2018 initiative injecting colour into an otherwise urban landscape. The gardens lie in the heart of St. Catherine’s Monastery, a 16th century building in Republic Street run by cloistered nuns and the Archbishop’s Palace in Archbishop Street. Both gardens will be open between 9am and noon and again between 4pm and 7pm during the three days of the festival. Valletta 2018 Foundation Chairman Jason Micallef said “The festival offers a unique opportunity for families to visit Valletta during Mother’s Day weekend and enjoy these secret gardens in the heart of the city”. “By means of the Valletta Green Festival, the Foundation is focusing on the cultural, economic and social regeneration of Valletta while contributing and encouraging environmental and ecologic improvement,” Mr Micallef added. Already in its third edition, the festival once again features the Infiorata, a large carpet made up of over 80,000 potted plants, bringing a pop of colour to St. George’s Square. Unlike previous years, this year’s edition of the Infiorata has a special meaning. The plants are in fact being used to reproduce the outline of one of the early plans of Valletta and its fortifications. This highlights the historical importance of this city, recognised as a World Heritage Site by UNESCO in 1980. Meanwhile, the colourful background design surrounding this outline is an artistic reinterpretation of the grid of straight streets which characterise Valletta. This marriage of past and present symbolises Valletta today, on its 450th birthday, a city where contemporary customs and fashions live side by side with a rich architectural, historical and social heritage. Environmental Landscaping Consortium Chairman Peter Calamatta said: “One of the main attractions of the Valletta Green Festival is the infiorata featuring over 80,000 potted plants grown over the past 12 weeks at (ELC) nurseries. Following the festival, the flowers are replanted in public gardens and green spaces around Malta and Gozo”. On Saturday 7th May, Tikka Banda sessions will be taking place from 10am till noon, while Charles and Friends will liven up St George’s Square with a mix of Blues and Jazz music from 8.30pm till 10.30pm.